In 1723, David and his elder brother John both became students at Edinburgh University. David read widely in History and Literature, as well as Ancient and Modern Philosophy, and also studied Mathematics and contemporary Science. Two years later, the education of the Hume brothers came to a halt when the Edinburgh family house in the Lawnmarket burnt down. The family returned to Ninewells to review their future. Neither David nor his brother formally graduated, which was not uncommon at the time. His elder brother took charge of the estate but a career for David had to be found. David returned to Edinburgh to study law, but did not settle and, after a year or so, he gave up his university course and returned to Ninewells. Hume wanted to understand how knowledge was obtained, he conducted experiments on himself, analysing his experiences through his senses and emotions, concluding that ‘nothing was certain’ in life. Questioning and analysing the world around him and human nature may have been inspired by his solitary walks around Ninewells and along the Whiteadder. During this time, his intensity was so great, that he suffered a nervous breakdown from which he took several years to recover. However, this crisis passed and he remained intent on developing his “new scene of thought”. 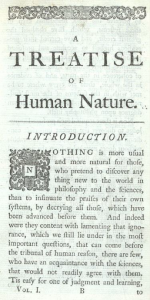 From the age of sixteen, he started to make notes for what would become his ‘Treatise of Human Nature’. This monumental philosophical text was planned and completed at Ninewells. 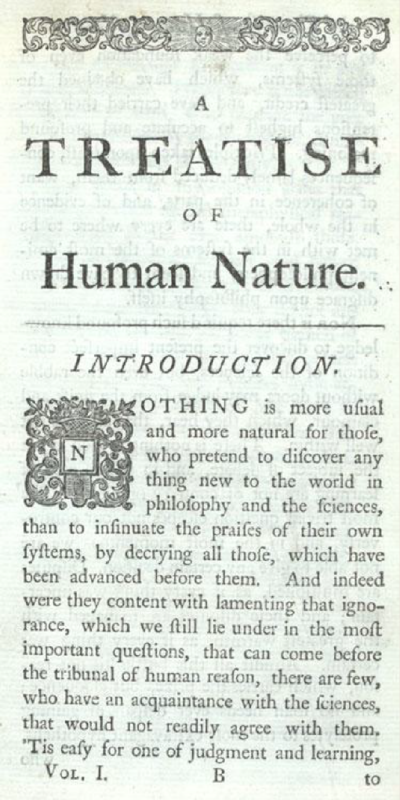 Today, A Treatise of Human Nature (3 volumes, 1739-1740) is his most widely-studied book.